Pink Claw / Papershell / Calico Crayfish Orconectes immunis. Female form I in berry. 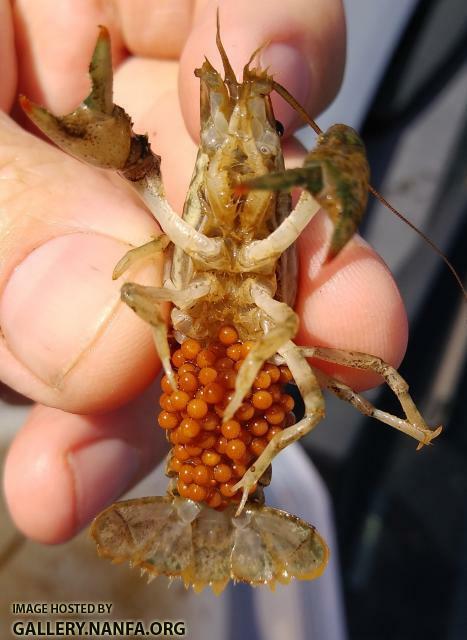 Interesting looking crayfish. Looks like a nice manageable size to keep in an aquarium. She is on the lower end of adult size range likely in first year as adult. They can get up to near 4". I will rear some of her young up next year where capacity for growth will be demonstrated. Best eating of crayfish I have access to, and among prettiest. Here's a related small-ish species from Tar River NC: O.carolinensis. Can't comment on taste; it's a rare endemic. I have only eaten store bought P. clarkii and wild caught O. rusticus and O. virilis. The wild caught species were much better. I assume it has more to do with freshness in my case, but I suppose certain species could be more palatable than others. Also, I didn't Cajun them up, treated them more like lobster. Steamed and served with drawn butter. That is a handsome crayfish Gerald. Thank you for sharing these beautiful pictures! 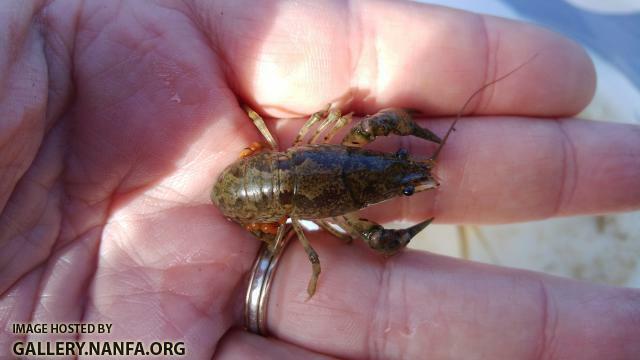 Like many others, my first aquatic adventures in nature as a young kid was collecting crayfish in a local creek. Here's one of my rusty crayfish perched on a large shell. These are local river craws.